When talking about artificial intelligence, probably the first things that cross our minds include the iconic movie Terminator, maybe the eerie one Her, or some other Hollywood blockbuster where robots are planning to conquer the human race and rule the world. Fiction often reinforces our habit of thinking in patterns and so we continue imagining anthropomorphized artificial intelligence. However, in the end – it all stays on the movie screen, right? Well, for those bright enough to notice – machines truly are taking over but in a less apocalyptic manner. Chatbots and intelligent assistants are more abstract and certainly don’t shoot laser beams out of their eyes but are indeed changing the face of marketing. Artificial Intelligence in Marketing: Why Should You Care? Artificial intelligence is rapidly gaining momentum in the marketing world. Amazingly, humans have managed to create computer software that can fully impersonate real social interactions (and even has the ability to make you laugh) – and the potential of it is pretty damn huge. It’s new and fresh, and all the cool kids in the marketing world are experimenting with it. 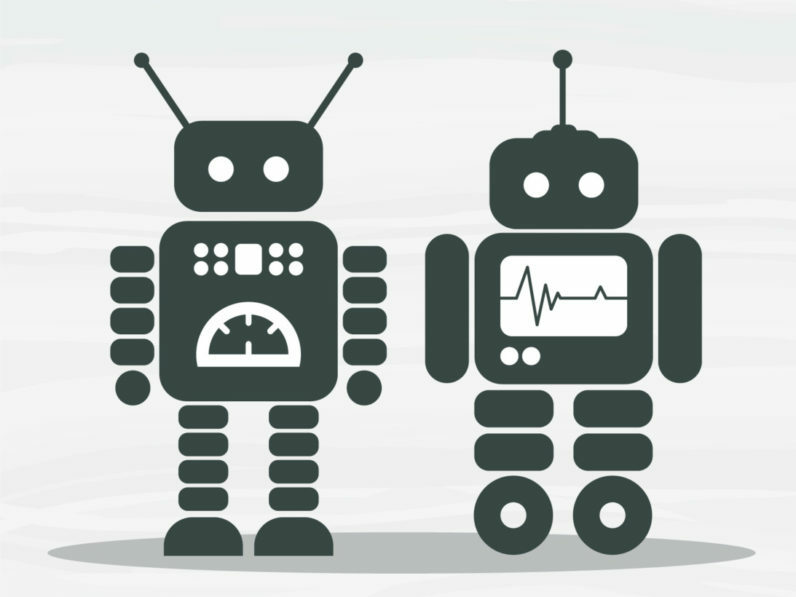 According to a survey by Oracle, 80% of businesses plan on incorporating bots into their marketing strategies by 2020. Here’s the thing: today’s users seek instant gratification and quick answers, and they want maximum convenience when it comes to making any kind of online purchase. Customer behavior has evolved as the majority naturally gravitated away from social networks to instant messaging platforms such as Facebook Messenger, Slack, or Apple iMessage. Since chatbots are truly an unexplored area, the competition is not as harsh as one would assume: businesses have enough creative space to develop their ideas and reach their target audiences in an innovative way. Marketers should definitely consider investing into AI but not before testing their audience. It’s like wooing a woman you have certain intentions with: you have to check your chances first. What is their natural way of interacting? How will I motivate my customers to engage? What problem am I solving for my future customers? Can I afford this and does it make sense for my business? Brace yourself: it implies a lot of trial and error and one should be prepared for bugs, UX testing, and complications that necessarily go with any kind of product launch. Roots of artificial intelligence go way back to 1960s, when MIT Artificial Intelligence Laboratory created ELIZA which stimulated real human conversation. Fast forward to the 21st century and you’ll notice incredible progress with intelligent assistants and chatbots such as Siri, Google Now, Amazon Echo, and Facebook M.
The biggest advantage of chatbots and intelligent assistants that marketers are slowly becoming aware of, lies in the fact they do not disrupt user experience. Opposed to traditional advertising in messaging apps we’ve already seen, the interaction that chatbots offer is far more user friendly and can help companies generate revenue faster and easier. App fatigue is real and this is where AI steps in to capture user’s attention. Adding humor to the equation helps the buying process become more fun. Take Tacobot as an example: the company decided to go for an amusing campaign and integrate the chatbot within the popular messaging platform, Slack. And what are they aiming for? Convenience. Even pleasure during the purchase. This interaction is easy, engaging, and almost entertaining. Most importantly, it helps marketers effectively bridge the gap between collected data and putting marketing into action. This way, customers’ journey is not fragmentized. According to the ComScore’s 2016 Mobile App Report, desktop engagement has been pushed aside: 58% of the people spend most of the time on their mobile devices. Looking at the broader picture of customers’ behavior, this is an important piece of the puzzle. We simply don’t have the time or patience to go through any complications in the buying process. Just check out the voice search craze and you’ll see the virtual assistants market is definitely heating up. Predictions for the future vary but most agree between 30-50% of the searches by 2020 will be generated by voice. Siri is one of the most advanced intelligent assistants out there and it basically leaves an impression of a real know-it-all character. Whether you want to reserve a table at the nearest five star restaurant, view your pictures from New Year’s Eve, or check the level of humidity in your city, you can talk to Siri and she’s got you covered. The possibilities seem endless. Another great example with a more business feel: Tara helps you hire freelancers and saves you a lot of time in the process. It is like chatting with the real person: you ask for assistance, the bot replies and asks you for further information until it has collected enough data to connect you with the perfect person for the job. Facebook M is also rather popular. Perhaps you need advice about what type of gift should you buy to your wife for the anniversary? The bot can offer suggestions and it enables you to make any kind of purchase: all you have to do is provide enough information. In addition, it’s conquering other platforms. Buzzfeed reported it took only 6 minutes to buy the tickets for the extremely popular Star Wars movie via Facebook M, whereas the process lasted for over three hours with no success (!) using Fandango, the well-known movie ticket service. Does this mean SEO world might experience an 180° turn? We are currently focused on queries typed in the search boxes and the proven ways to improve rankings – but the increase of voice searches and the rise of bots might throw something completely different on us in the not-so-far future. Gone are the days when one could afford the one-size-fits all approach: let’s face it, we all love being treated as special snowflakes. Today’s users expect to encounter the exact type of content they are interested in so if you’re looking to survive on the market – you have to keep up. Chatbots are precious as they are the most advanced way of tracking consumers’ behavior based on their previous searches. Bots can distinguish patterns and help marketers get to know their buying personas better, determine what type of products users most frequently look for, and adjust their marketing strategies accordingly. Based on all the gathered data, companies can create personalized advertisements and boost their sales: it’s like gentle push for your customers towards making a purchase. If you’re a marketing pro, you simply cannot ignore this new technology. Because of the completely natural and human-like way chatbots and intelligent assistants interact, users have a feeling of communicating with a real, genuine person. Although it sounds a bit odd, bots allow you to basically eavesdrop their conversation and take notes of what your buyers like and dislike and how they feel about your brand. It directly helps you display more relevant content in front of your audience and reach higher conversions. Of course, not everything is so peachy: chatbots as we know them are still a new technology. Setbacks include a sometimes too lengthy process as bots need to gather all the necessary info before allowing the user to buy a certain product or book a service. Who wants to chat about flowers for ten minutes if you can simply make a phone call and order them instantly? Ain’t nobody got time for that! So yes, it can be tiring and as we mentioned – we humans became too spoiled and don’t want to waste a minute of our time. Keep in mind deep neural networks are something that’s constantly being worked on: teaching machines how to interact (and dare we say – think) takes time. The final verdict? Artificial intelligence is a huge game changer in the marketing world. The technology is still in the initial phase and it’s making the first baby steps but it looks like its time is yet to come. If you’re swimming with the big fish in the business pond, chatbots in your marketing strategy are definitely not a question of why but how.